DataONE provides training to scientists, students and data managers via presentations, workshops and online resources that covers aspects of managing, preserving, analyzing and visualizing data. Below is a list of our in-person training events. You may access online learning materials via https://www.dataone.org/education and view the public DataONE calendar for other activities. December: AGU 2018 Meeting Washington, D.C.
INS17: What is Keeping You from Publishing Your Data? Tuesday 12/13 13:40 IN23C-1785: Do Community Recommendations Improve Metadata? Collaborative workshop with iDigBio, Symbiota, ASU, NCEAS and AMNH. Joint workshop with Terra Populus. 2014 UNM Summer Institute for Environmental Informatics: Environmental Information Management, Environmental Data Analysis and Visualization and Spatial Data Management in Environmental Sciences. 2013 UNM Summer Institute for Environmental Informatics: Environmental Information Management, Environmental Data Analysis and Visualization and Spatial Data Management in Environmental Sciences. ESIP 2012 Workshop: DataONE Architecture and How to Become a Member Node. AMS 2012 Workshop: Primer on Data Management. Ocean Sciences 2012 Workshop: Data Management for Scientists. Macalester College Workshop: I. Best Practices for Managing Data through the Data Life Cycle and II. Data Management Plans and Policies. 2012 UNM Summer Institute for Environmental Informatics: Environmental Information Management, Environmental Data Analysis and Visualization and Spatial Data Management in Environmental Sciences. AGU 2011 Workshop: Data Management 101 for the Earth Scientist. Supercomputing 2011 Workshop: Big Data Means Your Metadata MUST Work. DataONE Implementation Workshop: Publishing data as a Member Node within the DataONE federation. ESA 2011 Workshop: How to Manage Ecological Data for Effective Use and Re-use: A Workshop for Early Career Scientists. ESA 2011 Special Session: Creating Effective Data Management Plans for Ecological Research. 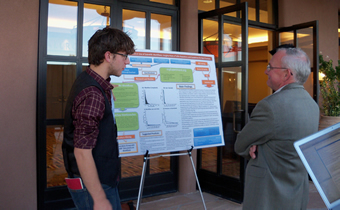 2011 UNM Summer Institute for Environmental Informatics: Environmental Information Management, Environmental Data Analysis and Visualization and Spatial Data Management in Environmental Sciences. Alaska Marine Science Symposium Workshop: Introduction to Metadata. Organization of Biological Field Stations Annual Meeting Workshop: Best Practices for Managing Data. USGS National Wetlands Research Center Workshop: Introduction to Metadata. USGS Forest and Rangeland Ecosystem Science Center Workshop: Introduction to Metadata. AGU 2010 Workshop: Writing Your Data Management Plan.